CEBU CITY- Melvin “Top Gun” Gumban (18W-0L,9KO’s) of the ALA Gym will fight for the Philippine super flyweight title against Weljan Ugbaniel (13W-2L-1D,4KO’s) of Sarangani this Sunday at the Gaisano Country Mall Carpark. Gumban had three fights last year beating Dino Lelis (TKO5), Jason Egera (UD10) and Roger Echavez (TKO1). Ugbaniel has not lost since 2011 and won twice last year against Rogen Flores (UD10) and Raymond Dayham (TKO1). 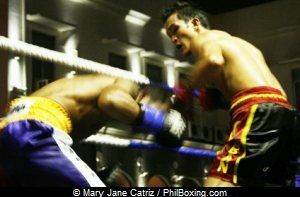 The Philippine 115 lb. division title was held by Marco Demecillo of the RWS gym but his last defense was on August 17,2013. Also penned to see action are Elmo ‘Bisdak’ Traya (6-1,5KO’s) vs Gabby Siempo (5-5-1,1KO) - 8 rounds, Vicente Cosido vs John Rey Lorico – 6 rounds, Melvin Jerusalem vs Rez Padrogane – 6 rounds, Gerald Suico vs Junrex Saldivia – 4 rounds, Junder Gregorio vs Jesson Horteza – 4 rounds, Joepher ‘MaiMai’ Montano vs Alvin Lagumbay – 4 rounds and Michael Estrella vs Jonnel Burlado – 4 rounds. This fight card will coincide with the renowned Sinulog Festival of Cebu and will be the first offering for 2015 of ALA Promotions and Cobra Energy Drink. Photo: Undefeated Melvin Gumban (R) in action against Egera.